This entry was posted in Prairie Management, Prairie Plants, Prairie Restoration/Reconstruction and tagged blanket, bluegrass blanket, control, controlled burns, grassland, grazing, how to control kentucky bluegrass, invasive grass, invasive species, kentucky bluegrass, measuring success, plant diversity, platte river prairies, prairie, prairie management, prescribed fire, rangeland, suppression by Chris Helzer. Bookmark the permalink. We’ve both heard Kent assert that fall burns should be utilized more for the control of cool season exotics and last November I was able to do one at a site that provided some limited comparison of treatments – 1) 2011 fall burn followed by no 2012 treatment, 2) 2011 fall burn followed by 2012 heavy spring grazing, and 3) no 2011 fall burn followed by no 2012 treatment. In both 2011 fall burn treatments (one grazed in 2012, the other not), both smooth brome and Kentucky bluegrass did very poorly in 2012. As of last week, the Kentucky bluegrass sod looks dead in both of the fall burn treatment areas. Granted, there was a severe drought influencing things, but the unburned site has smooth brome and K-bluegrass looking like it would normally look in almost any given year. Very interesting. As you say, would be interesting to know how much the drought played into that (maybe especially drying out the soil over the winter?). Keep trying it and let me know what you find out! Interesting data. In my ongoing project with re-introduction of Platanthera ciliaris on an 850 acre site, we are looking at the effect of burning, either fall or spring, in relation to population spikes of “Bracken Fern” and how this management tool of “burning” is interacting with these explosive population spikes of this fern, thus shading out under story plants. An important topic to prairies is discussed here. This is great information! Hey Chris – K-Blue and smooth brome are both invasive here in the southern Kansas Flint Hills, not to mention tall fescue. All of those 3, however, are pretty good early forage for cattle in the spring, so we have been trying to keep it under control by pretty heavy grazing early, followed by long rest periods of 100 days or so. Only been doing it a couple of years, so no real results yet. Using some patch burning as well, will have see how it goes. Good for you. I notice here that cattle would much rather eat brome than bluegrass, so it can be hard to get them to focus enough on the bluegrass that I always get the control I want. We’re playing around with late-spring fires, in combination with grazing, to see if that helps. Not sure yet. I think Steve’s comment/suggestion about fall burning is a good one too. Not sure if it would work as well down in the south, but I don’t know. I was feeling good about fall grazing for a while too, but now am not sure if it was doing what I thought. I need to set up a better controlled experiment to test that. Would be helpful if the weather were more consistent (but maybe less fun). I planted a small 10′ by 15′ area of prairie and unfortunately the surrounding lawn has lots of crab grass in it. Do you have any recommendations on controlling a species that spread aggressively by root suckers in the warm months of the year? Right now I’m thinking of giving roundup a try as its an awful pain to dig it out individually amongst the other plants I already have growing. Roundup could work if you were very targeted, but will just be a temporary fix because you’re dealing with an annual plant that come back again next year. If you do use it, apply it before the crabgrass flowers, if you can. My understanding is that many annual plants respond to Roundup by speeding up seed maturation, and you can still get seeds to drop from plants that you spray – which seems patently unfair. I noticed you have not included a control where grazing has been excluded. Kentucky Blue Grass is extremely grazing tolerant. 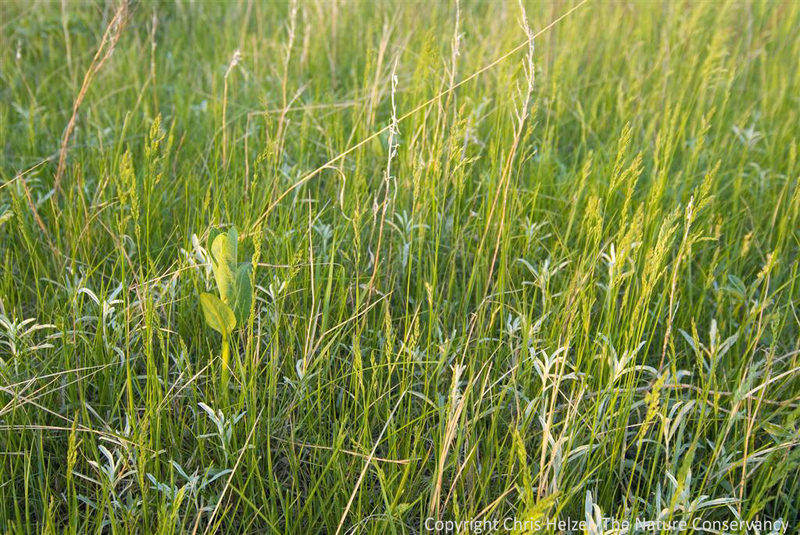 Grazing weakens the prairie grasses, hence the increase in forbs. It is not surprising that the Kentucky Blue Grass would increase in a restoration being grazed, until it reached the same level as in the degrade prairies. The reason you are not seeing a decrease in Kentucky Blue Grass in the degraded prairie is probably because your management regime is not all that different than the management by the prior owner. The increase in diversity is undoubtedly a result of seeding. I agree with Winter18944 that your prairie would likely have less Kentucky Blue Grass if you burned in Fall. This just makes sense if one considers the life cycle of the plant. Another reason to burn in Fall is because it is better for the Spring flora. An additional factor worth correlating with the frequency of Kentucky Blue Grass is soil fertility. Kentucky Blue Grass is a much better competitor in fertile soil. This is a fact any lawn professional will tell you. As the soil fertility rebalances, the Kentucky Blue Grass should become less vigorous and have a reduced frequency. A change in the frequency of Kentucky Blue Grass should not be attributable to reduced fertility levels until the fertility has decreased to the point that it is the limiting factor in plant growth. This may take many years. This could be an alternative explanation for why you are seeing a drop in frequency in Kentucky Blue Grass in 1/100 m plots at Dahms west pasture. However, without statistical error bars one is only assuming the drop in frequency of Kentucky Blue Grass is a real occurrence, and not the product of a small sample size. James – I don’t think I agree that grazing weakens prairie grasses, at least time-controlled grazing. Certainly overgrazing does, but the prairie evolved under heavy grazing pressure from ruminants and it a natural part of the ecosystem. Keith, I think James is referring to a short-term decrease in grass vigor as a response to grazing (followed by recovery in vigor after grazing ends). I definitely see that, and it does help increase forb diversity by reducing that grass competition. 1. Our management is actually significantly different from previous owners’, in terms of stocking rate, grazing system, and more importantly rest periods (not to mention the use of fire). We spend a tremendous amount of time evaluating and adjusting that management. 2. The increase in diversity we’re seeing in our degraded remnants is certainly not a factor of seeding, except in small areas. The data set I linked to shows some of the major species that are increasing over time. Overseeding is helping, but has so far been constrained to a fairly small proportion of our sites as we continue to refine those methods. 3. We do actually have some grazing exclosures – mostly in restored prairies – but we keep them small because we see lower plant diversity and floristic quality in them than we do in our grazed areas. Exclosure from grazing can reduce bluegrass, but can also decrease abundance of many plants we want – in both remnant and restored sites. I certainly don’t have this figured out yet, but the point of the blog post was that we seem to be able to keep bluegrass suppressed enough through fire/grazing treatments that a more diverse plant community is emerging. 4. Kentucky bluegrass is certainly tied to soil conditions, but not necessarily just high fertility areas. For example, some of our strongest bluegrass monocultures are in old swales with very gravelly soils that are close enough to groundwater to support spring vegetation but then so dry in the summer that little warm-season growth occurs – a perfect set up for bluegrass. We are collaborating on a research project that should tell us more about correlations between soil conditions and plant species occurrence. Yes, I am good at making broad statements and large assumptions. LOL I have seen Poa pratensis be a problem in low flat areas where restoration is occurring. I’m still not yet convince it will not get out competed over time. It has been 22 years, but many were without fire. I may be too optimistic about the Poa pratensis disappearing in time. What we have in my area that is a similar issue is Poa compressa. This species is a common invader of our rare gravel hill prairies. Chris, I went out to the big patch of Kentucky Blue Grass at a local restoration. I think this patch has shrunk since the last time I looked closely at it years ago. The area has been seeded often and burned bi-annually in the Fall. The primary species I saw within the Blue Grass dominated zone were Wild Bergamot, Rosinweed, Tall Boneset, and a sparse representation of all the tall grasses in that order of frequency. I think the tall grasses can compete well enough with Kentucky Blue Grass if they can get past the seedling stage. The center of the Kentucky Blue Grass dominated area was almost pure Kentucky Blue Grass. This center area looked like it had not carried fire in many years because of all the thatch. It may be desirable to herbicide areas dominated by Kentucky Blue Grass that stubbornly will not burn. Burning off the dead Kentucky Blue Grass thatch should aid in the establishment of higher quality fuel species. Regular Fall fires should help reduce the Kentucky Blue Grass frequency. Next Spring I will go out and compare the amount of Kentucky Blue Grass in the older areas of the restoration with the newer areas of the restoration. There is still a lot of Kentucky Blue Grass in the newer areas of the restoration. Unfortunately, I cannot make observations on the frequency of Kentucky Blue Grass in the older areas of the restoration because they were just burned recently. I seem to remember a post where you presented info on the impacts of grazing on plant richness and FQI. However, are there any rare species (plants or higher up the trophic levels) that benefit significantly from grazing? More specifically, is grazing allowing for any rare species to be present that otherwise would not be present? I don’t have many truly rare plant species in our prairies, so that’s a hard question for me to answer. 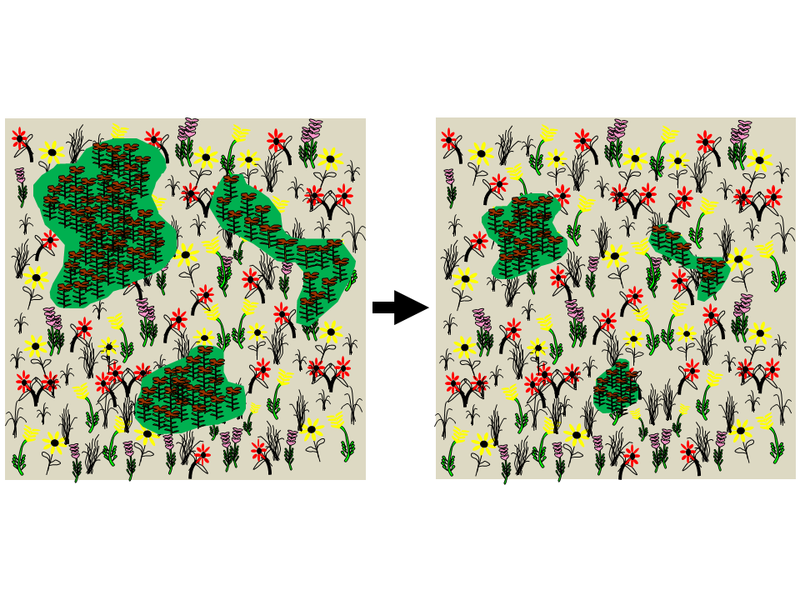 When I think of grazing and prairies, I think about the increased structural heterogeneity I can create through various stocking intensities, and I think about the ability to suppress parts of the plant community to allow plants that do better with less competition to gain some territory. 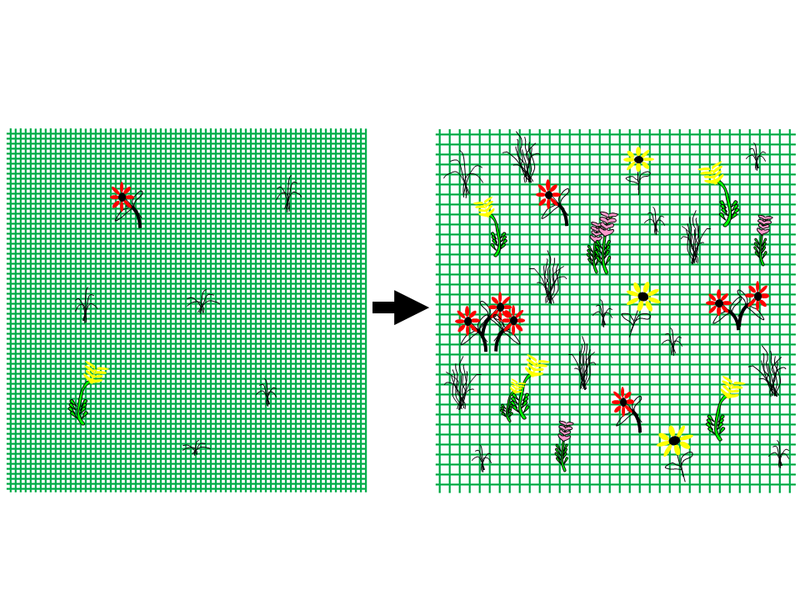 Which plant species are suppressed depends upon stocking rate (higher stocking rate suppresses nearly everything, lower stocking rate suppresses only those species favored by livestock). Suppressing dominant grasses can certainly release species that like disturbance, but also can allow germination of seeds from nearly any plant species by increasing light and moisture availability. Allowing frequent and sufficient rest periods can ensure that plants that are negatively impacted by grazing get a chance to recover. So grazing can (at least, theoretically) increase the breadth of the plant community without losing any species that are sensitive to grazing. I guess one extreme example of a rare plant that requires grazing might be blowout penstemon (Penstemon haydenii) in the Nebraska sandhills, which is only present in actively blowing sand, such as in blowouts. Those blowouts are usually created by long-term intensive grazing, combined with dry windy weather. I’m sure there are other rare plants that require disturbance in order to thrive, but I can’t think of any offhand. I know I’ve come across species lists of rare, or conservative, plants from eastern prairies that I see doing very well in our more heavily grazed prairies, and I’ve wondered if grazing in those eastern prairies would benefit those rare plants. That’s just pure speculation, however. If I were going to have a problem, I would choose Kentucky bluegrass or smooth brome! What about spraying with roundup this time of year? Maybe on an unseasonably warm day. Most, if not all the good plants are dormant now. In some cases fall spraying can be a good idea, but you have to be VERY careful. There are a lot of native cool-season grasses and sedges that are also green this time of year, as well as a fair number of wildflowers (especially plants with a rosette stage). In an unplowed area, i would certainly not spray more than some narrow strips the first time, to see how things look the next year. Spraying works best when a site is so degraded there really is nothing else left, but in that situation, spraying alone probably won’t solve the problem… Anyway, it may be worthwhile in some situations, but it’s a good idea to look very carefully to see what else is green and growing. In a southeast Nebraska restoration planting, I’ve used glyphosate on K-blue in December and was pleased with the results. I used it on patches that were solid K-blue while the surrounding matrix was nicely developed natives 3 or so years post-planting. I did it because I was worried the K-blue would maintain it’s hold on those patches but after I sprayed, it died and the patches filled in with natives. Causation or correlation? Don’t know, but visually it was apparent the Glyphosate caused at least topkill of the K-blue at that time of year. I suspect that anytime the air temperature is above freezing this plant is at least minimally metabolically active, which should lead to some level of chemical susceptibility. There are also some grass specific herbicides that are supposed to be selective to the point of not harming sedges. I’ve used them but never in a setting where I was really concerned with non-target issues so I can’t really say if they’re all they’re advertised as. Two chemicals that I’ve used (and examples of trade names they’re marketed under) are fluazifop (Fusilade) and sethoxidym (Poast). Having said these things about these various chemicals, I too would urge caution and start with small test areas to see if you’re comfortable with the results. Glyphosate is very effective against Kentucky Blue Grass. However, I still would probably save my money by not using herbicide on Kentucky Blue Grass in most cases. The exception would be if I was sowing seed I spent great effort collecting. I still think fire and time will eventually cause the Kentucky Blue Grass to be edged out. I will have to take a closer look next Spring. The thing about Kentucky Blue Grass is there can be lots of it, but you would not readily notice it because it is so short relative to most tall grass prairie species. I started with a clean slate when I restored 130 acres on our farm in 1993. The land had been farmed for 20 years previous so there was little if any perennial grasses. I have 7 different soil types from light sand to CEC’s over 30. My experience with Kentucky bluegrass has been this, I am in NW Minnesota. I had to do some midsummer (July 15) close mowing to keep White sweet clover from going to seed, I mowed the same areas 2 years running. This really favored bluegrass, the mowing line was distinct and was visible for about 2 years. The lighter soils do seem to have a higher occurance of bluegrass but I would not consider it invasive. I harvest grass in the fall, burn on a 2 and 3 year interval and this seems to keep sweet clover in check. The other feature that stood out was how the mowing set back the False indigo (Amorpha nana). False indigo is uncommon in our part of the world and I believe years ago most of the prairie was cut for hay on an annual basis. We have several prairie remnants on our farm and only one has False indigo, this remnant is remote in the fact it is bordered by a steep ravine on each side. I know this area was grazed for many years but my guess it was never mowed and this is the reason Amorpha nana persisted. One of our rarest plants is thought to be dependent upon grazing … running buffalo clover. I have never seen it. “Plant Of The Chicago Region” mentions three vouchered specimens. The author states he has seen four plants in one location many decades ago. Another extremely rare plant thought to be dependent upon grazing is Solidago shortii. This plant has only been found in Ohio (historical), Kentucky, and Indiana. I’m not sure eliminating grazing would help an early restoration out compete Kentucky blue grass. Answering questions like this are why Chris’ work is so important. I should stop writing now. If Chris has to answer any more comments he may have to quit his day job. If that happens then we will never know how different management techniques decrease the invasive Kentucky Blue Grass. In spring 1998 I did some small plot work on the Dalm and Brown areas with clethodim herbicide for Kentucky bluegrass control. This herbicide is a safe grass specific product only. It doesn’t do anything to the broadleaves. If timed properly, it can control the cool season grasses prior to warm season grass emergence. No soil residual. I got about 75% control of the bluegrass the first year, with good release of warm season grasses and forbs. Maybe something to look at on a highly degraded area in a system of overseeding with native desirable species. It has a label for native prairie restorations. Bluegrass is very invasive in the Loess Canyons. Prescribed fire seems to really set it back, but I am not sure why, because most prescribed burns occur in March, when the grass is only a couple inches tall. This is not exactly the preferred fire timing to set back bluegrass. My hypothesis is that the grazing deferment, coupled with prescribed fire and conservative post-fire grazing really stimulates the native big bluestem and other tall and mid warm season grasses. These grasses are more suited to the upland range sites and, with the restoration of fire as an ecological disturbance, they outcompete bluegrass. Andy – interesting. As you say, I think it’s likely that fire is tipping the balance toward those native grasses. It might not actually be hurting the bluegrass as much as helping the other species. As long as the result is what you want, that’s success! Chris, I keep thinking about your post and how I spent over $100 this summer on water trying to keep my KBG lawn from dying. It seemed to be worth the money because many of my neighbors had to replace their entire yards. I think trying to get an entirely new lawn established from seed would have been much more costly than what I paid for water. I think many people were surprised by the death of their lawn. Many told me they were not worried because their lawn always regrew after a dry summer when the rains returned in fall. That was not the case this year. I think what killed the KBG was not merely the lack of water, but the heat. Lawn under trees fared much better even though those trees sucked up every last bit of water their roots could get. In the sun, without soil moisture for evaporative cooling, the soil surface was hitting well over 120 F. The natives with deeper roots and meristem should be able to withstand the hot conditions much better. The shallow rooted blue grass baked and died. Maybe grazing followed by hot-dry conditions would do more to control your bluegrass than any fire regime. James – you’re a step ahead of me. I’m working on a potential blog post about why bluegrass is so hard to keep alive in yards but hard to kill in prairies. I’ve found some interesting research that relates. We’ll see if I can piece the story together well enough to share. While pulling up KBG that invaded my garden I had another thought. The KBG came up easily in the soil that had been softened from recent rains. I wonder if grazing in late fall with sheep, which I was told pulled up and ate the entire plant, would reduce the easily pulled out KBG without harming the deeper rooted natives. Sorry Ray – I don’t know the seed market in Michigan very well. I would check with some of the TNC folks there to see if they have ideas. I can give you western seed sources, but that’s not your best option. I planted a 1/4 acre prairie mix in 2012. Site prep was probably not ideal, but I also had a lot of lawn grass seed washed into the prairie the same year from heavy rain. The mix includes side oats, little blue, Canada wild rye, and a little bit of June grass and prairie brome, There are multiple forbs in the mix as well. I burned the entire area this spring and about 1/4 of the planted area looks quite good.Others poor to terrible. My question is, other than burning, is there a “window of opportunity” to use Round Up on this to decrease the undesired grasses? Are there other chemical options at this stage of my prairie? Hi Aaron, it’s a tough one. You could try some Roundup application in the late fall, after the first hard freeze or two, but on a day of 60 degrees or higher. (If you can find that window!) You’ll likely knock out some of your native cool-season grasses (Junegrass, prairie brome, wildrye) too, but if you have thick areas of bluegrass, it might be worth the tradeoff. You can always re-seed some of the worst areas if you get a good kill on the bluegrass. Early spring application (warm day) can work too, but you’re even more likely to hit some natives then. I have a few more questions and please forgive my ignorance. What should I see in the blue grass that is, “getting ready to bloom”? In SE Minnesota, when should that typically occur? Also, when is the appropriate timing for a Fall burn and what are the benefits? Is there some risk of burning in the Fall and exposing the ground in the Winter months? Lastly, If I were to re-seed some areas, what method would you suggest? Would one “scratch up the soil” and over seed after the Spring burn? If have enough grass to burn in the Fall, would a Winter/dormant type seeding be a better option? Hi Aaron, glad to help. You can wait until you start to see the first flowers showing up in bluegrass. Or, you’ll see that it will start to “bolt”, meaning that it sends up a stiff flowering stem that will later have the flower on it. You could burn as soon as you start seeing the grasses bolt or just start to flower (or sometime around then – it’s not an exact science). I would guess it’ll be in late April or maybe early May. Here in central Nebraska, bluegrass often flowers in mid-April. You can burn anytime you want, and it will have varying effects, not all of which are easy to predict. I don’t think you’ll do any serious damage whenever you decide to burn; nothing that the planting won’t recover from. The ground may dry out over winter after a fall burn, but it’s not generally enough to be a big deal. Experimentation will teach you much! If you seed after a burn, you shouldn’t have to scratch up the soil, but it might give you a little better germination if it’s feasible. You could use a hard tine rake or some kind of light harrow, if that’s available. Burning in the fall and doing a winter seeding can be a great option, but might be tricky to integrate with your bluegrass treatment program, depending upon when you’re going to spray. If you can get the schedule to work out, though, sure – go for it!